I decided to do a very different kind of Color Challenge. 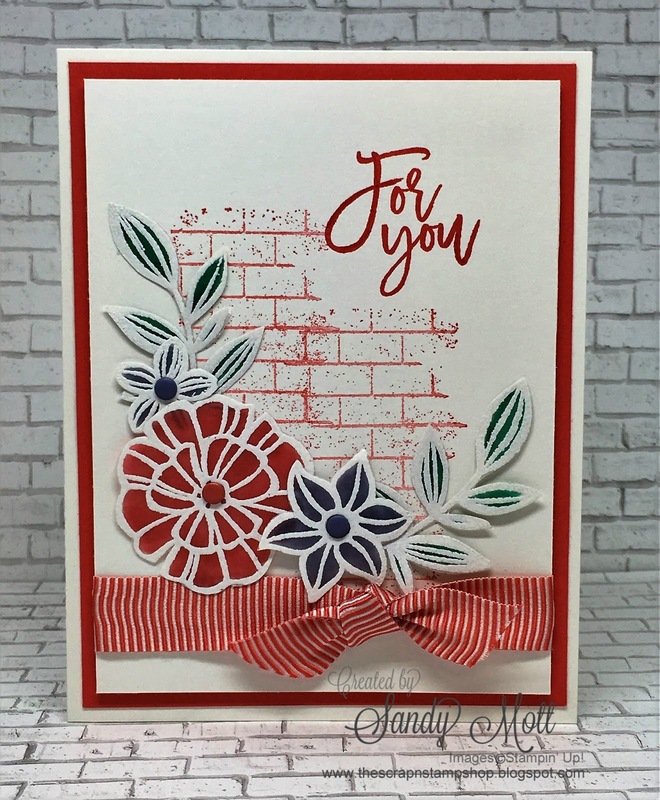 While scrolling through my news feed on Facebook, I came across this page "Stampin' Up! Colour Challenge". I always love a challenge, so I joined the group. All I had to do was ask for a color challenge and someone in the group would give me one. Since I'm not shy, I asked for it. The colors I got were Watermelon Wonder, Perfect Plum, and Emerald Envy. Say what? Those would be colors I wouldn't think of combining. When I first put them together, I wondered what I got myself into. Then I remembered that the whole purpose to this challenge page is getting you to use color combinations you wouldn't ordinarily use or using those inks that get very little use. And since I had opened my mouth, I needed to follow through. And I'm so glad I did! I knew right off that I had to tone down the colors a bit. 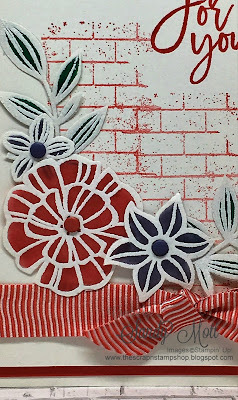 They were "honking" at first, so I embossed vellum with white emboss powder and colored the flowers and leaves with my markers. Voila! Not honking anymore. Actually, I may just be a new fan of those colors! Maybe. I stamped off twice with the brick wall using Watermelon Wonder ink. The brick wall is a fantastic stamp located right in the middle of a Halloween stamp set called "Ghoulish Grunge". I love it and will be using it long after Halloween is over. I stamped it twice to make the wall bigger. The sentiment is from "Thoughtful Branches", which by the way, is still available. 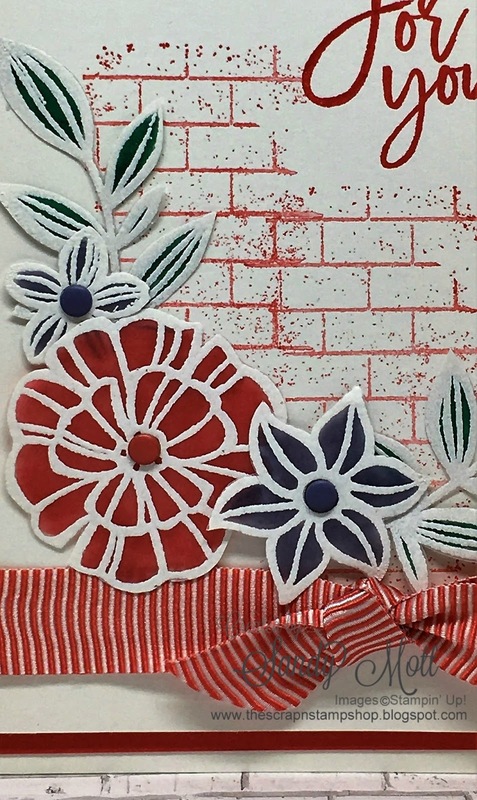 Here's a close up of the wall and the flower embossing. The final touches were the 5/8" Mini-striped ribbon in Watermelon Wonder and the Enamel Shapes for the flower centers. Bottom line - I loved this challenge and the colors turned out beautifully. It's good to do challenges, whether it be from card sketches, stamp sets, or color combos. Try it! If you want to join this color challenge group, click HERE. All products used to make this card are listed below and available in my online store. The host code for September is XXXDMY2A. Order soon to take advantage of my Customer Rewards Program (see tab above) to get free cards/tutorials. The Clearance Rack has been updated with deals up to 60% off. Once these gems are gone, they are gone forever. Click the picture below to see the deals. For the first time ever, first-time Paper Pumpking subscribers can buy one month at the regular price of $19.95 and get the second month FREE! It's a Paper Pumpkin BOGO deal that you don't want to miss. Paper Pumpkin is a monthly subscription service by Stampin' Up! that delivers all the stamps, ink, and paper you need to create a papercrafting project. Everything is cut and ready to go so you can skip to the fun. To order, go to PaperPumpkin.com and use the promo code BOGO. Don't forget to indicate me as your Demonstrator! Hurry up - the offer ends October 10. Tha's petty good. Would not have come up with that combo! Thanks Liz! I couldn't imagine those colors either, but they worked! 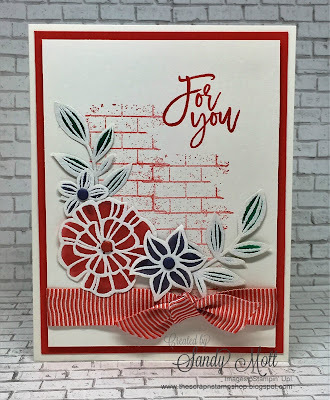 Love your card, Sandy! I also love that Ghoulish Grunge set and have used it a lot. Going to check out this group - sounds like fun. Thank you Gail! It's very fun!